By Karen Davis, PhD, President of UPC In late December 2014, 7,500 turkeys and 200 pigs suffocated and burned to death in building fires in Minnesota. Star Tribune reporter Maya Rao said in her article that more farmed animals - overwhelmingly birds and pigs - are vulnerable to building fires than ever before: "Massive casualties in the Upper Midwest, the heart of the nation's livestock production, have surprised even longtime professionals," she wrote, noting that 300,000 hens died in a La Grange, Wisconsin fire, 150,000 hens died in a Galt, Iowa fire, and 13,000 pigs died in a fire near Truman, Minnesota. These are just a few of the barn fires that have recently been reported. Minnesota's fire marshal's office does not track the number of animals killed in farm fires which typically break out in rural areas where no one's around in whatever state they occur in. The U.S. Department of Agriculture has taxpayer-funded reimbursement programs for agribusiness catastrophes such as fires, disease outbreaks, snowstorms that collapse building roofs and similar disasters affecting thousands of animals at a time. So protected from the effects of the fires are the owners of the trapped animals that tracing the causes of the fires isn't required. Insurance companies are said to be "working" with farmers to improve safety. In July 2012, United Poultry Concerns launched a campaign to persuade the National Fire Protection Association - "the authority on fire, electrical, and building safety" in Quincy, Massachusetts - to develop standards to protect farmed animals from preventable fires after learning that the NFPA had proposed that sprinklers and smoke control systems be installed in all newly-constructed farmed animal housing facilities. Agribusiness trade groups protested NFPA's proposal, arguing that the installation and maintenance of sprinkler systems in farmed animal housing complexes could cost billions of dollars. Many complexes, they said, are in places with short water supplies. Sprinklers would mean having to add water storage tanks and fire pumps, digging and maintaining wells and other inconveniences. Veterinarian Rebecca Gimenez, a member of an NFPA committee that is working on the issue, also posed questions such as whether chickens sprinklered to stop a fire would become hypothermic and die even more slowly and miserably. In response to agribusiness lobbying and the questions being asked, the NFPA voted down proposals in 2012 and 2014 that would have set standards for fire protection for farmed animals. The issue is not dead, however. As Gimenez told Animals 24-7 in an interview published January 22, 2015, the NFPA has designated committees to research fires in animal housing facilities and report their findings by March 2015. The number of animals in most agribusiness facilities (facilities are buildings, sheds or barns that are part of a complex often comprising several identical buildings with thousands of animals in each one) and the conditions in which they are kept - 20,000 or more baby chickens being raised for meat in a single shed, 125 thousand egg-laying hens in a single battery-cage unit, for example - make their evacuation when a fire breaks out virtually impossible. The overriding question, however, as was noted by Animals 24-7 is: if even companion horses and backyard hens with names are overlooked in fire safety standards, "what chance do animals have whose only identity is as production units?" Since the U.S. Department of Agriculture limits the use of animals exposed to smoke inhalation as a human food source, most animals who survive a fire, depending on their degree of injury, are destroyed at the site; others however may be trucked while alive and suffering to a destination to be turned into animal feed or some other product. In 2012, owners of a New York dairy farm where a fire killed many of their cows and calves said that surviving cows suffering from smoke inhalation were picked up to be "sold at auction as beef cattle" (Dairy Herd News, Aug. 7, 2012). Some animal rights activists have criticized our campaign for fire protection for farmed animals arguing that these animals are so miserable already that they might as well die in a fire that ends their existence - the sooner the better. I agree, and yet I can't quite concede that the animal advocacy community should turn its back on these poor animals and do nothing to try to help them. To me this feels wrong. Just let them burn; let agribusiness companies and farmers get away with their monstrous cruelty to their helpless animals. 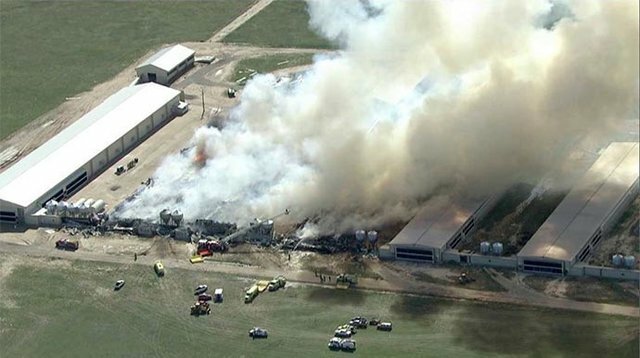 Let them get away with saying as was said by the owners when 50 of their cows died in a dairy farm fire in 2012, "We are so thankful that no one was hurt" (Dairy Herd News, Sept. 17, 2012). In October 2014, Dawn Bellis, Secretary of the NFPA Standards Council, replied to my inquiry about the status of their deliberations on fire protection for farmed animals that the report of "NFPA 150, Standard for Fire & Life Safety in Animal Housing Facilities," would be available for viewing on January 16, 2015 at www.nfpa.org/150next. The report, now posted, includes a webpage listing all public comments submitted in 2014 urging fire protection for farmed animals. Resolution: While the technical committee agrees that no animal should die in a preventable fire, a blanket requirement for sprinklers or smoke control is not a one size fits all solution. Sprinkler discharge may be detrimental to some more sensitive animal types. A smoke control system without a suppression system may actually spread smoke throughout a facility. A combination of prevention and protection designed for the specific animal occupancy is required in order to protect both the animal and human occupants of these facilities. The current breakdown of animal categories is not sufficient to address many of the unique needs of these animals and therefore, the committee has established two task groups. The first task group will work to define the animal occupancy categories beyond Category A and B. The second task group will gather data on animal housing facility fire sources. The task groups will then work together to develop protection levels specific to the unique needs and challenges of the animal categories.